Photodynamic therapy has many advantages in cancer treatment including apoptosis, necrosis and local inflammation reaction activities. But it has also disadvantages in clinical approach. Main problem is recurrence. That’s why we tried to improve out treatment results through the different generation of photosensitizer, conjugated material (photosensitizer and anticancer drug or quantum dots), combination of adjuvant material(EGCG, selenium，arsenic compound and IL12）approach during the past years. (-)-epigallocatechin-3-gallate(EGCG), has been known to possess anti-inflammatory, anti-tumor, anti-oxidant, and anti-angiogenic properties. PDT combined with EGCG demonstrated a significant suppression of tumor growth in vitro and in vivo. But EGCG lowered the uptake of Radachlorin before irradiation. Thus, an EGCG must be supplied post to photodynamic therapy. In addition, the PDT combination with EGCG in vivo led to a significant increase in levels of p21 and p53 expression at 6day after PDT. Selenium, an essential trace element possessing anti-carcinogenic properties, can induce apoptosis in cancer cells. Moreover, the PDT combined with selenium demonstrated a suppression of tumor growth in vitro and in vivo. The tumor growth by the PDT combined with selenium was significantly reduced. As4O6 is considered to have anticancer activity via several actions such as free radical producing and inhibition of VEGF expression. Anti-proliferative effect of combination treatment was significantly higher than those of TC-1 cells treated with either photodynamic therapy or As4O6(62.4 and 52.5％ decrease, respectively, compared to photo dynamic therapy or As4O6 alone, P<0.05）. In addition , cell proliferation in combination of photodynamic therapy and As4O6 treatment significantly decreased by 77.4％ compared to vehicle-only TC-1 cells(P< 0.05). Cell survival pathway(Naip1, Tert and Aip1) and p53-dependent pathway(Bax, p21Cip1, Fas, IGFBP-3 and Mdm-2) were markedly increased by combination treatment of photodynamic therapy and As4O6. Recently we tried to accomplish the systemic PDT in 1eukemia animal model using A20 cells for better clinical results. A20 cells were injected into Balb/c mice through the mouse tail veins, and intravascular fiber inserted after photosensitizer injection(5 min) , then PDT was performed. PDT also induced apoptosis and G1 arrest in A20 cell. Systemic PDT increased the survival rate (P<0.01) in leukemic animal models after PDT. This is the first report of the effects of systemic PDT could effectively be applied to systemic and spread tumors, for which tumor formation areas cannot clearly be determined. We are continuously study the possibilities of increasing the efficacy of PDT with photosensitizer adjuvant strategy and systemic approach too. Photodynamic Therapy(PDT) is based on the light activation of specific chemicals to produce cytotoxic species that react with biological substrates in the milieu they are produced, resulting in damage and killing of cells. The light activatable chemicals that are used in PDT are referred to as photosensitizers(PS) and typically activated in 600nm plus wavelength regions so as to minimize interference from endogenous chromophores. If the PS can be localized preferentially in the target tissue, then, combined with the localized volume that is activated with light there is an increased level of selectivity not available in the more commonly used systemic therapies. It is generally believed that, with the PS in clinical use currently, the active toxic species is singlet oxygen making PDT an oxygen dependent modality. New molecules are being designed that could reduce this oxygen dependence. Following PDT-induced death or damage to cells and tissues there is also a biological response that can mitigate the effectiveness of the treatment or the harnessed for optimization. Therefore, strategizing applications of PDT requires an understanding of chemistry, biology, physics and photophysics. In addition，the practical application of the modality benefits from technological developments for light delivery and imaging. 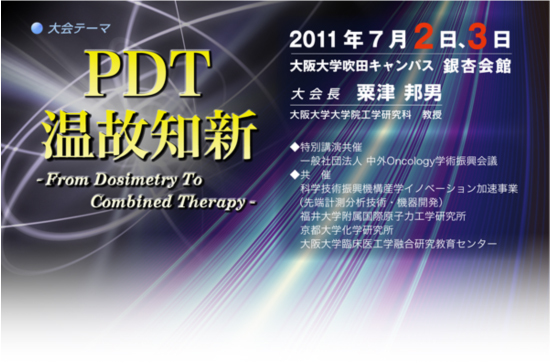 PDT thus form a bridge between the physical sciences，biology, technology and medicine and inherently multidisciplinary. Applications of PDT range from cancer treatments at many anatomical sites to infections and several are FDA approved. New disease targets and approaches to PDT continue to be developed. An overall introduction to PDT followed by a discussion of mechanism involved and specific applications will form the basis of this presentation.